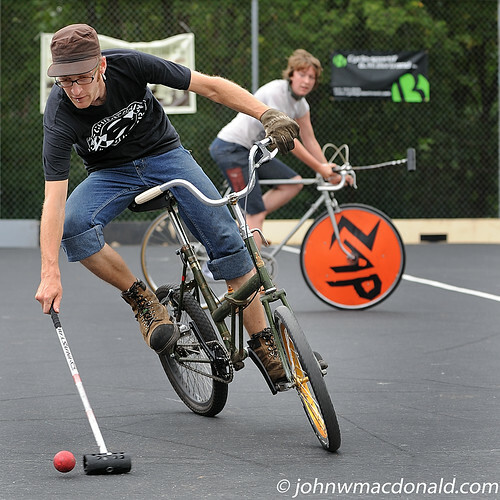 Alex - Bike Polo, originally uploaded by johnwmacdonald. Alex reaches and connects with the ball during one of the many games of the 2008 North Side Bike Polo Invitational in Ottawa's Little Italy. Go for the polo stay for the sandwiches at DiRienzo's. North Side Polo Invite 2008 Schedule of Events. Friday Aug.1 NSPI kick off party. 6pm @ World exchange plaza, Alleycat/Scavenger hunt. $10Alleycat ends at Ev Tremblay park. Polo til dark.After party @ B-Dubs place. 41 Arthur St. Just north of Somerset.$1 BBQ. $2 Beers. 50/50 draw. Get drunk. Saturday Aug.2 Polo round robin. 10am-9pm. Get ready for the best time of your life! 9:30 Simpsons Trivia Alleycat. You don't have to be fast.Race ends @ Club Saw , 67 Nicholas St. Goldsprint qualifier, hang with all your friends, get yer drink on till 2am. Sunday Aug.3 Polo final. 10am-8:30pm.Awards party. Goldsprint finals. 9:30pm-2amGet yer drink again. @ Club Saw, 67 Nicholas St.